Mexico doubles down on pivot away from U.S.
Mexican officials kick off talks with their counterparts in the European Union on Monday to update their own free trade agreement initially signed in 2000. Talks between the two sides have taken on a sense of urgency and are on an accelerated schedule now -- the first time Mexico and EU held these talks was in 2013. Both sides had expressed a desire for a new agreement for years, but only announced "accelerated" trade talks shortly after Trump took office. "It's a shared desire to proceed as quickly as possible with this negotiation," Andrew Standley, the European Union's ambassador to Mexico, told CNNMoney in February in Mexico City. That's not all. Mexican officials head to Argentina later this week for the World Economic Forum's Latin America summit where they will likely reiterate their interest in buying more goods -- particularly corn and soy -- from Brazil and Argentina instead of the United States. 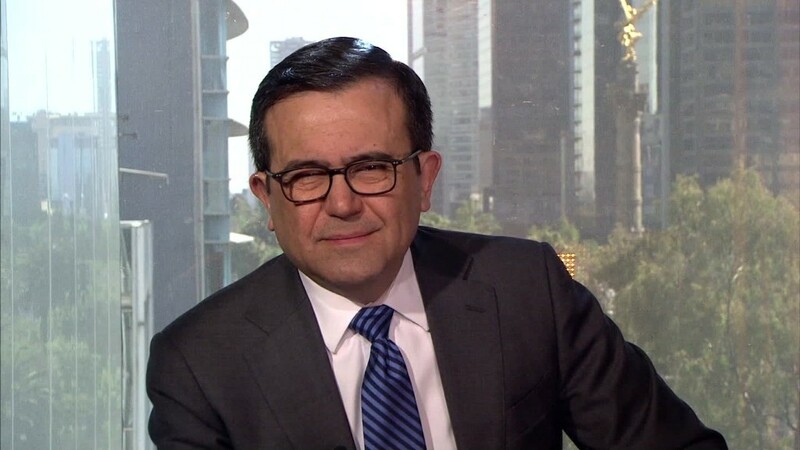 Last week, Mexico's deputy economic minister, Juan Carlos Baker, told the Financial Times that Mexico is already in talks with the two South American giants to strengthen trade ties. "There is a lot of potential for a win-win situation," Martin Redrado, Argentina's former central bank president and director of Fundacion Capital, a non-profit research institute, told CNNMoney. "Mexico has always been welcome in Latin America." Mexico is not feeling so welcome in North America. Trump has threatened to use tariffs against Mexican imports and to withdraw from NAFTA, the trilateral free trade agreement that also includes Canada. (However, the Trump administration recently signaled it may not seek a wholesale rewrite). It's a fortuitous time for Mexico to look south and east. Argentina and Brazil, two of the world's most closed economies to trade, have leaders trying to shed protectionist policies for free trade. Argentine President Mauricio Macri eliminated tariffs last year on agricultural exports put in place by the country's previous populist regime. Argentina just ended a recession, yet is growing slowly. In Brazil, President Michel Temer is seeking just about any measure to help boost the nation's economy, which is suffering through record high unemployment and its longest recession in history. Europe is also eager to find more willing trade partners after talks on an ambitious trade deal with the U.S. -- the Transatlantic Trade and Investment Partnership (TTIP) -- stalled well before Trump won office. The challenges, experts say, is for Mexico to find areas where it complements -- instead of competes with -- its partners. As a major auto manufacturer, it may risk competing in Europe against auto giants like Daimler (DDAIF)'s Mercedes and BMW (BMWYY). And Argentina and Brazil are also auto production hubs. But Volkswagen has its largest plant outside of Europe in Mexico, and BMW is slated to open a new facility in Mexico in 2019. For now, the relationship appears to benefit both sides. However, most Mexican auto workers make parts -- not the final car -- so the key will be deciding which parts Mexico manufactures and which others produce to make all sides happy. Experts say the same complementary strategy has to be applied to agriculture to prevent lost jobs. 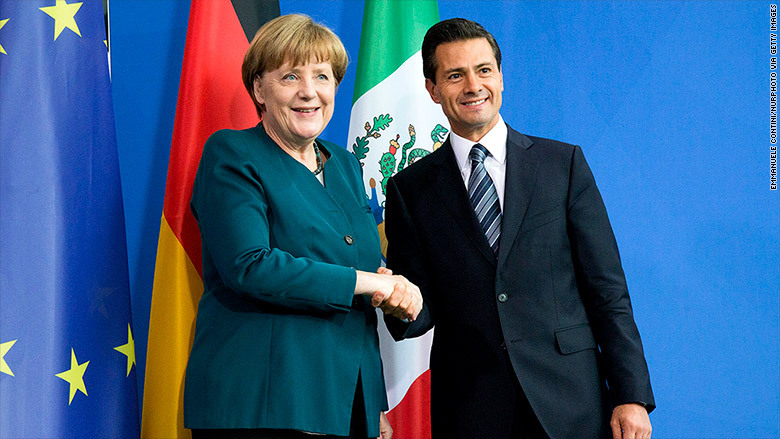 Still, Mexico has already had free trade success with the European Union. Between 2005 and 2015, annual trade flows between the two doubled to $56 billion. Europe has represented 40% of total foreign investment in Mexico since 2000, according to EU officials and data.